30, 50, 250, & 1000-lb capacities. Optional low pressure switches available. 250 & 1000-lb tanks are retrofitted with full 3/4" service valves & copper dip tubes to meet capacity of commercial recovery units. 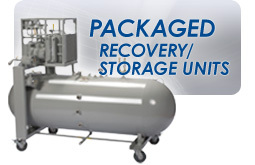 Typical recovery tanks have small diameter ports that restrict refrigerant flow and decrease recovery rates. RefTec 250 & 1000-lb D.O.T. tanks have been fitted with full 3/4” service valves and copper dip tubes to eliminate restrictions and allow faster refrigerant transfer. Tanks service R11, R12, R22, R113, R114, R123, R134a, & and additional high pressure refrigerants and blends. For R410a, use only 30 & 50-lb tanks. Quick connects are available for tanks servicing low pressure refrigerants.